The famous birthdays of March 19th come under the Pisces zodiac sign. 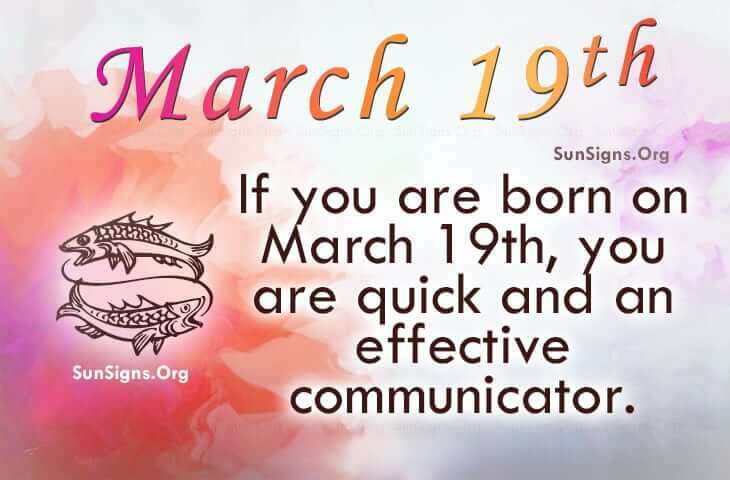 They are quick and have the ability to be an effective communicator. Additionally, they are detailed and organized. As a matter of fact, they could teach on a university level if they so choose. Famous people born on 19th March actually have many talents. So a profession could be hard to decide on. When it comes to personal relationships, they can be unrealistic and end up disillusioned. Sometimes, they destroy friendships because they have been thoughtless and rash. Holding on to ill feelings mostly affects one person and that is the person holding the baggage. Normally, those who share this famous birthday are happy people but have a tendency to exaggerate the truth. They may think it hurts no one. But in the end, they come off looking like a liar. Where their health is concerned, those born on March 19th may need to replace the hard liquor with a coke or even a glass of wine. Famous people born on March 19 make loyal and trusting friends. They are quick learners that can hold a grudge. Otherwise, they have pleasant birthday personality traits. They are in good health but perhaps should seek assistance in disciplining their children. Take a look at the March 19 famous birthday celebrities listed below.